that it’s how much love we can pour into a second that counts. 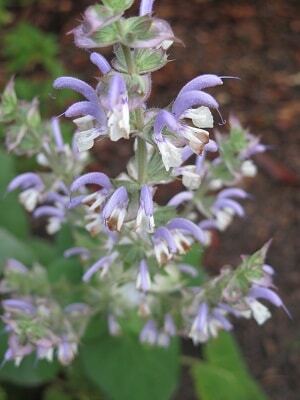 Clary sage (Salvia sclarea) should not be confused with Sage (Salvia officinalis). Aroma: Bittersweet, spicy, camphoraceous, muscat-like. Plant: Biennial or perennial herb grows between 30 and 100cm with tall flower spikes rising above hairy heart-shaped leaves. The flowers are pale blue, lavender, pink or white. Main Growing Areas: France, Russia, USA, Morocco, England, the Mediterranean, Australia. Major Constituents: The exact composition of the oil varies depending on the area where it is grown. Linalyl acetate, linalool, alpha-terpineol, geraniol, sclareol. Interesting snippets: The herb was highly esteemed in the Middle Ages for digestive disorders, uterine and menstrual complaints and as a general nerve tonic. In 19th century England the herb was used to add bitterness when brewing beer. The beer was renowned for producing a euphoric intoxication followed by a severe headache. Was used to combat the night sweats and strengthen the immune system of patients with tuberculosis in the past. Part of Plant used / Extraction: Flowering tops and foliage by steam distillation. A higher elevation and drier soil will yield 2-3 times more oil per plant than one grown at a lower elevation and in moist soil. Therapeutic actions: Muscle relaxant, antispasmodic and regulator of woman’s hormones. Scanty periods, PMS and said to be a uterine tonic able to induce labour and to restart contractions if they have stopped. Muscular stiffness and spasm, tired, aching legs, headache and migraine. Emotional and Spiritual: Stress related conditions. She seems to encourage vivid dreams and enhances creative work due to her narcotic effect. 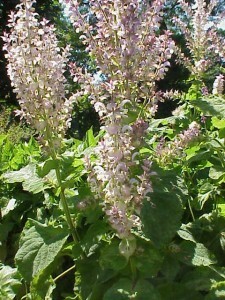 Clary sage causes feelings of euphoria and elation. 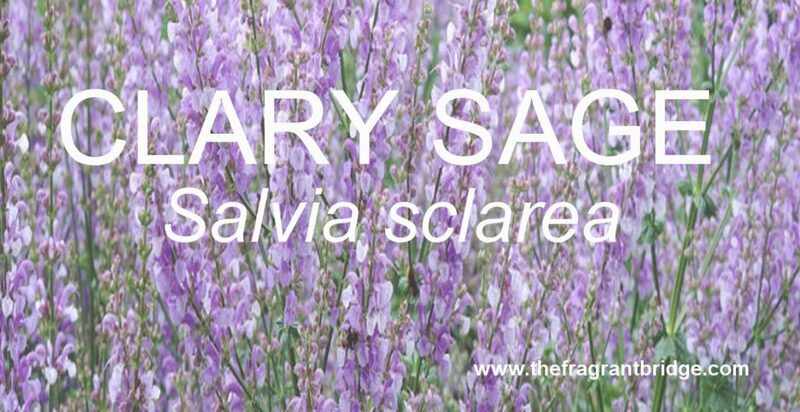 Gabriel Mojay writes that clary sage is indicated for nervous anxiety and depression characterised by changeable moods, indecision and emotional confusion. When we have lost our felt instinct for our life’s true purpose unable to see clearly in the here and now clary sage restores lucidity to the instincts and allows inspiration to flow. Robbi Zeck writes that clary sage switches on the inner lights, caresses the creative mind, awakens your sensory perception and broadens your intuitive horizons. It enables you to access deeper parts of the subconscious as you explore options and sift through information, leading to inspired decision-making. For times of emotional and mental confusion, mood swings and indecision, or just when you feel burnt out and weepy. Clary Sage restores harmony and regenerates interest in life, helping you to be clear about what you want and how to get it. Do not be influenced by others. Stay clear and focused as to what you want. 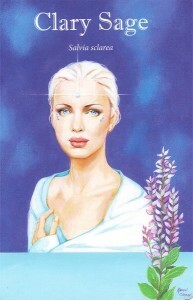 Access and work with your intuition to remove events that distract you from your path. Travel that road emotionally uplifted, but in a calm state. Clary Sage does not throw you over the top, but keeps you confident and steadfast in reality by connecting you to the earth. Broaden your perception and your horizons, tapping into your subconscious to make those choices clearly, and now. 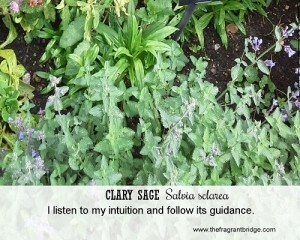 Fragrant Change Healing Card: I listen to my intuition and follow its guidance. Safety: Non-irritating, non-sensitising, non-toxic. Best to avoid using if you will be drinking alcohol as she can lead to a severe hangover and nightmares. Some authors have suggested this oil not be used during pregnancy as it may cause a miscarriage but there has been no evidence shown that supports this. This entry was posted in Essential Oils and tagged clarity. emotional confusion, clary sage, depression, intuition, muscular aches and pains, muscular stiffness, nervous anxiety, PMS on May 25, 2016 by Carole Hodges. Menopause is a normal part of life that every woman will go through. Menopause officially occurs when you haven’t had a period for more than 12 months. It may occur anytime between 40 and 55 years of age, Some women may start menopause earlier due to a medical condition. Peri-menopause can last from 3 to 10 years and precedes menopause. During this time you may have heavier or lighter irregular periods and some of the symptoms of menopause. The changes are due to the hormonal changes you are undergoing when your ovaries stop working. Even though menopause is a natural phase for a woman if you have any concerns about the above please seek medical advice. 1. 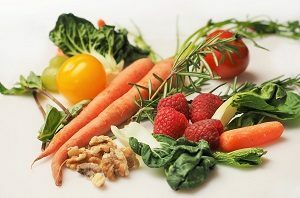 Eat a healthy diet that includes plenty of fruit and vegetables, whole grains, foods rich in omega-3 fatty acids and cut down on your salt and sugar intake. 2. If you smoke quit as it can trigger hot flushes. 3. Exercise regularly to help prevent osteoarthritis, aid weight loss and help decrease the intensity of hot flushes. 4. Reduce stress by meditation, self and professional massage, aromatherapy, deep breathing, playing sports, gardening, listening to music or whatever self-care techniques you enjoy. Make yourself a priority for at least half an hour a day. 5. Maintaining your ideal weight – you may need to eat less and exercise more if you have gained weight as your metabolism slows down during and after menopause. 6. Have a relaxing bedtime routine. Have a relaxing bath before bed, read an inspiring book and go to bed at a regular time. Avoid alcohol and caffeine late in the day. 7. Dress in layers so you can easily remove any extra layers when you experience hot flushes. 8. Strengthen your pelvic floor by doing Kegel exercises if you have urinary incontinence. 9. Decrease vaginal discomfort by using water-based vaginal lubricants such as K-Y jelly. Choose one that doesn’t contain glycerine because women who are sensitive to glycerine may experience burning and irritation. Regular sexual activity can also help. 10. 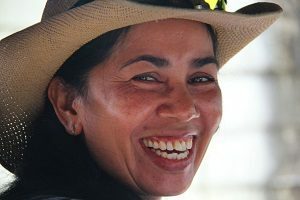 Hormone therapy and herbal supplements may be of help to some women but are outside the scope of this blog. If you wish to explore these options book an appointment with your GP or herbalist. 11. Laugh more as it can stimulate your immune system, help you cope better with stress and enhance your memory. 12. Watching your thoughts and replacing negative thoughts with positive ones can help with emotional issues. A gratitude journal may also help. If depression and anxiety are taking over your life don’t hesitate to seek medical assistance. Using essential oils in the vaporiser, personal inhalers, bath, sprays and massage can help you get through this time. *Remember if essential oils and diet don’t help improve your depression seek medical advice. Choose 2 or 3 oils for your blend and add to a spray bottle containing rose or neroli water or hydrosol. Keep in the fridge and use whenever you feel a hot flush coming on. Shake the bottle well before using. 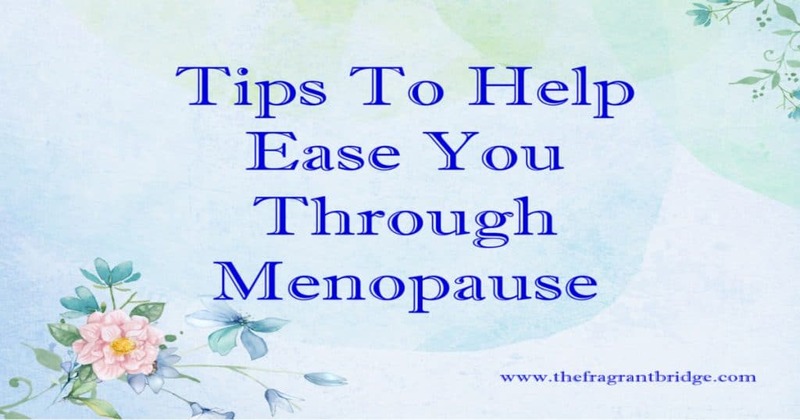 This entry was posted in Essential Oils and tagged essential oils for menopause, hot flushes, menopause tips, symptoms of menopause on May 18, 2016 by Carole Hodges. 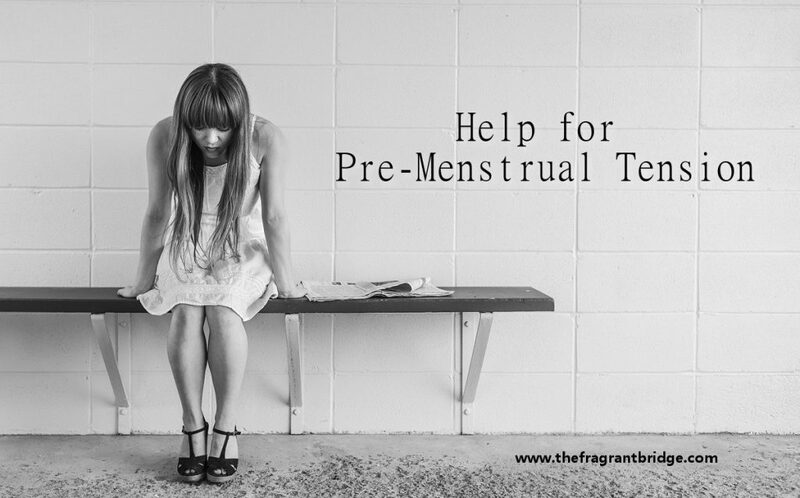 Pre-menstrual tension is the term given to the many different symptoms you may experience in the week to ten days before your period. There are many reasons for PMT but fluid retention caused by low levels of oestrogen and high progesterone levels just before your period in addition to stress and poor diet maybe the cause. This can result in the following physical symptoms; tenderness of the breast, swollen abdomen, headaches, nausea, uterine cramps, fatigue, weight gain, constipation and mild to severe fluid retention. Emotionally you may experience depression, weepiness, irritability, food cravings, loss of concentration, lethargy, tearfulness and in some rare cases violent and dramatic personality changes. Using essential oils in the bath, vaporising them and massaging can make a difference to how you feel each month. Gently massage your blend over your lower back, solar plexus, tops of your thighs and buttocks and your abdomen approximately one week before your period is due and for approximately one week afterwards. Do for 2 or 3 months to assess the difference. Placing a hot compress (be careful not to burn yourself) over your abdomen may be soothing. Adding 4 or 5 drops of clary sage, marjoram or lavender essential oils to the compress water is helpful. Rose – calming and emotionally healing. Buy as a 3% dilution in jojoba and use as a perfume. Make a blend using any of the above oils. Use up to 30 drops in total in 30 mls of cold pressed vegetable oil. 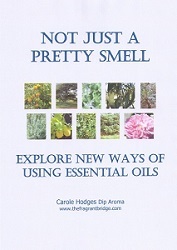 You may need to experiment to come up with your perfect blend or see your aromatherapist for a blend to suit you. In addition to the above you may want to supplement your diet with a good vitamin B complex and evening primrose oil. This entry was posted in Essential Oils and tagged painful periods, PMT on May 11, 2016 by Carole Hodges. Essential oils when used in low dilutions are safe to use during pregnancy. Some therapists prefer not to massage with essential oils until the second trimester but there is no problem using these oils in a vaporizer or the bath. Essential oils can help with morning sickness, lower back pain, insomnia and other discomforts that can occur throughout the pregnancy. It is important to use good quality essential oils from a reputable company and not from a $2 shop. If you have any concerns speak to your aromatherapist. I do not recommend using essential oils internally during pregnancy. The oils below are for external use only. Following are some common discomforts and the essential oils that can be used to help them. Anxiety Bergamot, frankincense, geranium, lavender, neroli, sweet orange. Insomnia Bergamot, roman chamomile, lavender, mandarin/tangerine, neroli, sandalwood. Irritated skin Roman chamomile, lavender. Morning sickness Roman chamomile, ginger, lemon, mandarin/tangerine, peppermint, spearmint, sweet orange. 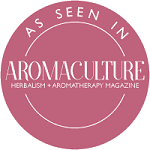 Muscular aches and pains Roman chamomile, eucalyptus, grapefruit, lavender, sandalwood. Stress Roman chamomile, frankincense, geranium, neroli, sandalwood, sweet orange. Stretchmarks – to prevent Frankincense, geranium, lavender, mandarin/tangerine. Swollen ankles Cypress, geranium, grapefruit, lemon, sandalwood. Note: Bergamot, grapefruit and lemon are photo sensitive so don’t use in areas exposed to the sun. The following oils are best avoided in pregnancy massage because of the possibility of skin irritation. They are fine to use in the vaporizer. Black pepper, cinnamon, clove, lemongrass, may chang, melissa, tea tree, ylang ylang. It is also wise to avoid using old, oxidised citrus, pine, fir and spruce oils. Massage oils, creams and lotions: Up to 7 drops of essential oils in total to 25mls or grams of cold pressed vegetable oil, aqueous lotion or cream. Don’t blend in baby oil or sorbolene cream, as the essential oils will not be absorbed into your skin. Vaporizer: 3 or 4 drops of essential oil. Personal inhaler: You can buy or have made a personal inhaler containing the essential oils that help with your nausea. If you don’t have a personal inhaler take a small bottle, 5 or 10 mls is large enough and place a few cotton balls in it. Add 2 or 3 drops of essential oils and close the lid. Whenever you are feeling nauseous remove the lid, have a couple of whiffs and replace the lid. The aroma should last the length of your pregnancy. Bath: 4 -5 drops in half a cup of full fat milk. Add to bath and swish. This entry was posted in Essential Oils and tagged morning sickness, nausea, pregnancy discomforts, stretchmarks on May 4, 2016 by Carole Hodges.